This is a beautiful bold entry level Chronograph watch. The bold styling and stainless steel makes it look like a much more expensive watch. The strap is kind of stiff and feels more plastic than polymer. All in all, if you dive and like a watch that can be worn at casual outings. This is a good start. This sporty men's watch from Joshua and Son's is powered by a Swiss chronograph movement featuring the date, 30 minute timer and 60 seconds sub dials. The silicone strap and brilliantly placed accents gives this timepiece a boost of style. 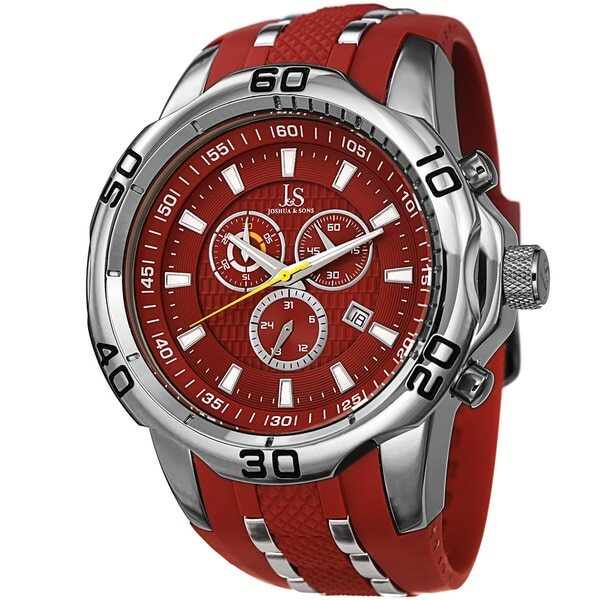 Bring a splash of color to any outfit with the red tones of this watch. The flexible strap shifts with you as you move to ensure comfort during long-term use. Rated for water resistance up to 99 feet, you never have to worry about sweat or washing your hands damaging the watch. THE PERFECT ALL AROUND WATCH .....FITS VERY COMFORTABLE AND CLASSY...THE PRICE WAS JUST GREAT. IT LOOKS MORE VALUABLE THAN WHAT IT COST.THIS RED DEEP BAND MATCHES EVERYTHING I WEAR TO A TOOTH.I AM VERY HAPPY WITH THIS PURCHASE..
Really big . Son wears it. The watch look and feel great on the wrist. Great work watch, the kids love it. I work with kids. Its really nice. It keeps good time. Also, you hardly know you have it on. "Is the chronograph function guaranteed? What is the warranty period? What is your return policy and where would it ship in the event it was returned?" This watch features a chronograph function and has a one year warranty. If you are not happy with your purchase please contact Customer Care within 30 days so we can assist you with the return. "I ordered the black model how did the red model show up on my order"
Hello Ron, you will be contacted by Customer Care. Have a great day. I like the watch that all.